My father sells paint, finishes and chemical coatings to businesses in southwestern Wisconsin. For a few years when I was small, I accompanied him on his travels each Take Your Daughter to Work Day. However, by the time I was around age 9 or 10, it was my younger sister’s turn to ride in the car, escape school, and have full permission to drink soda. Naturally, I didn’t want to go to school if I didn’t have to, and I’m sure that factored into my wheedling to go spend the day at the Poynette Public Library instead. We went there as a family at least once a week anyway, and at that age I was already meandering between the children’s section, a back room filled with my few lingering favorites with their big glossy pictures and words like poetry, and the nonfiction, home to answers about a myriad of mysteries, like adolescence and puberty; the adult fiction section was nearby, with Jude Deveraux’s novels being simply written enough to be understood, historical enough to be compelling, and sexual enough to be an education in and of themselves. I usually wound up back near the yellow-spined Nancy Drews, even if I tucked, ahem, other books into my stack to be checked out as surreptitiously as possible. 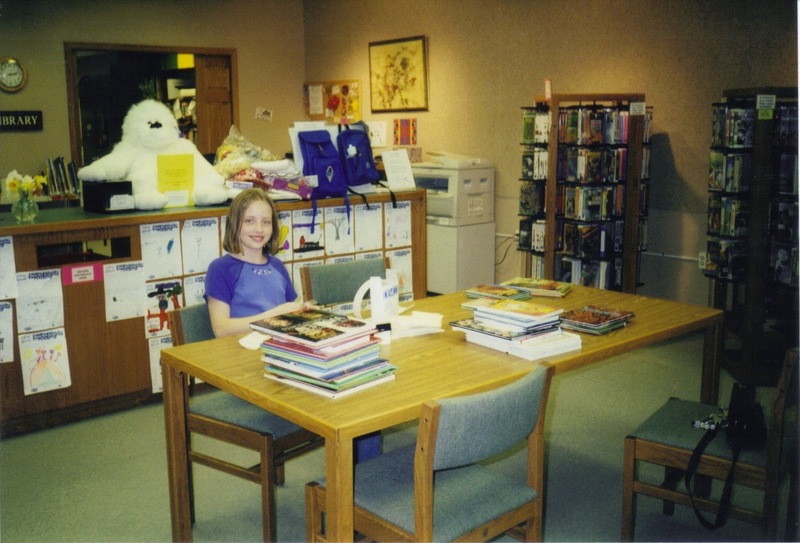 I came across the pictures my Mom took of that Take Your Daughter to Work Day when I was home over break, and I was reminded of how foundational the public library was to my development. Even so, when I decided to take the path of library school and eventual librarianship during my college years, I didn’t even think of this experience. 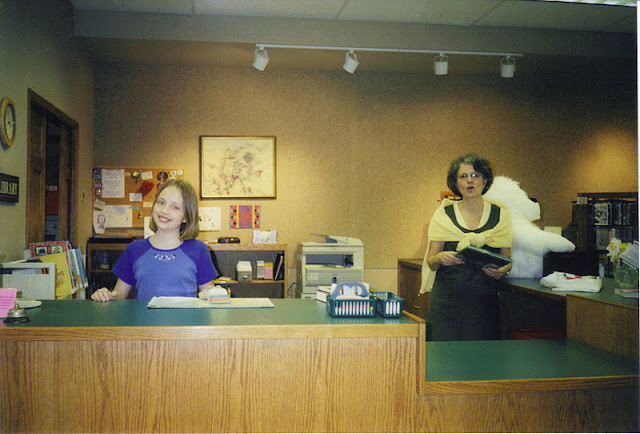 It wasn’t ever a great dream of mine to become a librarian, and I’m very glad of that. I think many people can take a childhood dream and be great successes, but it also has the potential to supplant reality with a romanticized version of events and you might grow resentful of what’s truly in front of you. All the same, I must say, really: If that’s not some burgeoning librarian pride in the below photo, I don’t know what it would look like. I’m back in Bloomington now. My already full life has been enriched by the presence of a waffle maker, so I’m planning to do things Leslie Knope-style for a while and have waffles day and night, at least until classes start next Monday. I’m a graduate student, so I highly doubt anyone would be surprised by this eccentric behavior. I worked yesterday printing maps for Cyberinfrastructure, though today I’m lingering at home, plagued by headaches. The Long Suffering Boyfriend’s (LSB’s) guitar professor is staying in our apartment for a few nights, so we’ll be cozy. It’s nice to have a visitor. 1) Using my personal Twitter account @notsosternlib!! I keep forgetting it exists! I think this will be easier now that I am an admin for Cyberinfrastructure’s Twitter (@cnscenter) and Facebook accounts. 2) Applying to and/or going to conferences. I’m scouting out the LOEX conference, MAC conference, and SIA conference for the spring semester. 3) Building a website for the LSB. It’s the perfect excuse to keep cementing my understanding of HTML and CSS. I’m learning Java now, and we’ll see where that takes me. There’s no reason for him not to have a website if he wants to be a professional jazz guitarist–and I can help him. 4) Making a CV. I have about fifteen different resumes that I keep mutilating to fit the job/scholarship/whatever just floating around on my computer. This is one of those things that I just have to do. 5) Continuing to charge through rejection, giving doubt a fair shake but ultimately continuing to move. I have my days (like yesterday) where I am convinced that I will be bulldozed by the competition, that I will never have the skills I need to get to where I want to be. I have to remind myself that I am paying (A RIDICULOUS AMOUNT OF) money to be in an environment where I can go to class and learn, then go to my job and learn. The skills are coming, piece by piece. I’m trying not to be impatient or hold onto unrealistic expectations. Jared Harmon put it excellently in this blog post… and I’m sure many of us at this strange point in our almost-grown up lives can relate.